Defense Secretary James Mattis announced a dramatic shift in military policy last week, and it threatens to plunge the world into new forms of conflict. “Adults in the room” is an old Washington expression. It has routinely been applied to political insiders who prove willing to ignore popular opinion in order to carry out the Beltway consensus of the day. “Centrists’ who want to cut popular and necessary social programs are a prime example. The term suits Mattis, whose speech reflects a longstanding bipartisan consensus about national security – one that is hawkish, profligate, and indifferent to the suffering of others. The “peace dividend,” the cut in defense spending that many people expected at the end of the first Cold War, is now officially dead. Counterterrorism, once said to be the top priority for recent US military policy, requires less investment in high-cost weaponry, including ships, aircraft, missiles, and nuclear arms than traditional war. Mattis has now declared, however, that the primary goal of the US military is to prepare for state-to-state conflict with “Great Powers” and “rogue nations.” If that goal isn’t challenged, it will be much harder to argue against massive investment in cost-intensive military technology. The founding members of “Team B” would be pleased. Mattis also complained about “spending caps” and declared that the US military is “overstretched and under-resourced.” That is, by all rational measures, an extraordinary statement. The United States is responsible for 36 percent of the world’s total military spending. The U.S. military budget is larger than that of the next ten biggest spenders – put together. It is four times bigger than China’s and nearly ten times bigger than Russia’s. China, Mattis’ leading Great Power threat, spends 13 percent of the global total, while Russia spends 4.1 percent. If the United States cannot defend itself from these nations, even with these disparities in spending, the military has a serious management problem. 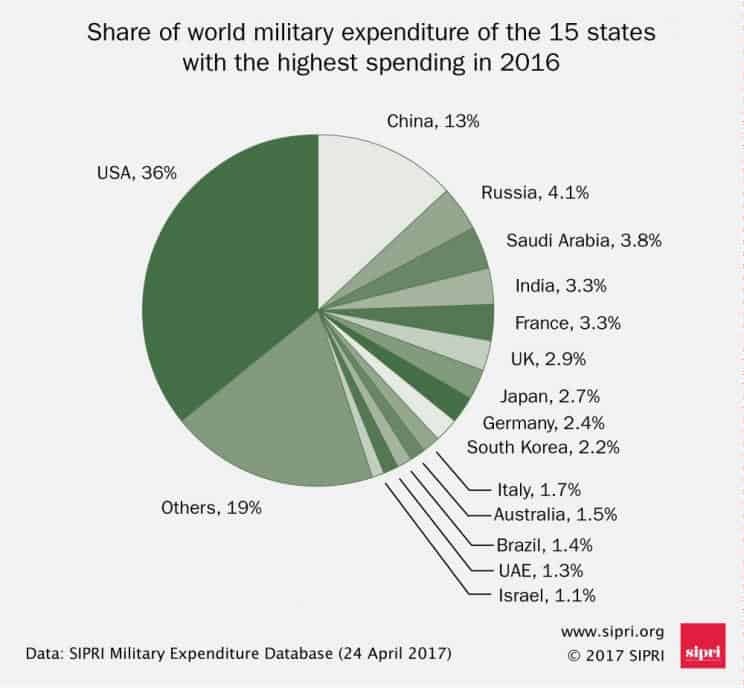 The disparity is even more striking when this country’s share of the world’s military spending is contrasted with its 4 percent share of the world’s population. Congress shows no sign of changing the status quo any time soon. When Trump requested a substantial increase in military spending, Republicans on Capitol Hill – and most Democrats – responded by giving him even more than he had requested. That statement does not have the ring of truth. But, if Mattis is right, is he the right person to fix it? By all accounts, Mattis excelled at military service. Overall, he appears to have taken a humane, hands-on, and reasonably intelligent approach to military leadership. Moderate remarks he has made as Defense Secretary been welcomed by liberals as a rare break from the racist rhetoric flowing from the White House. Nevertheless, there is some cause for serious concern. One at least on occasion, Mattis made intemperate remarks about Afghan civilians. Ethical questions have also been raised about Mattis’ relationship to Theranos, the now-discredited blood testing company which he helped while in the military – and whose board he joined when he left. The board’s now-apparent negligence in the face of seemingly obvious flaws and fakery has been the subject of informed commentary. Before he took office, Congress had to grant Gen. Mattis a waiver from the law which states generals must wait seven years before serving as defense secretary. Given the current climate of unqualified admiration for generals – a sentiment, incidentally, that’s not shared by many of the World War II veterans I’ve met – Mattis got his waiver. Mattis didn’t need a waiver for having been on the board of defense contractor General Dynamics. He should have – and it should not have been granted. The conflict of interest is financial, of course, but it is not only that. In 2016, Mattis’ last full year on the board, General Dynamics reportedly did nearly $19 billion worth of business with the US government. Total revenues included $6.6 billion for aircraft, over $5 billion for nuclear submarines, more than $8 billion for command-and-control and IT services, and $2.4 billion for wheeled combat vehicles. There is an inherent conflict between the insular perspective of the privileged insider and the public interest’s much broader range of needs. And post-retirement paydays aren’t the only problem. The promise of future riches can color the decisions senior military officers make while they are in uniform – and, in Mattis’ case, while he runs the Defense Department. Hopefully, liberals will one day find the appointment of a defense contractor to lead the military as objectionable as the appointment a Goldman Sachs executive to lead the Treasury Department – and for similar reasons. The new cold war promises to be as expensive, as dangerous, and as pointless as the last one. Negotiation with Russia, the world’s second-largest superpower, seems to be out of the question. Democrats oppose it because the intelligence services have reported that Russia interfered in the last election. Republicans oppose it because they’re predisposed to dislike all negotiation. Tensions were already on the rise in 2016, before Trump took office, after U.S.-backed NATO troops began conducting maneuvers and taking positions on Russia’s front line. In that sense, Mattis is simply making an existing state of cold-war hostility official. The stance toward China, which Mattis has named as the leading threat, is paradoxical at best. On one hand, the Secretary of Defense has declared that we must be prepared to wage full-scale war against it if the need arises – and that we are not yet able to do so. On the other hand, the US trade deficit with China reached an all-time high in 2017. Washington’s “adults in the room” scorn any attempt to rectify this imbalance as “protectionism” and “trade war.” But actual war with the most populous nation on earth is apparently not out of the question. There was a large and vibrant movement against the last cold war. Left-leaning movements held rallies against runaway militarism, and even most mainstream Democrats supported negotiations and “détente.” It remains to be seen whether “the Resistance” will oppose the new cold war or fall in line behind those Democrats who are currently waxing sentimental about George W. Bush. We need new and humane values and goals for our military and foreign policy. Nevertheless, Democrats like Reid continue to marginalize the voices of sanity while exalting the same “adults in the room” that nearly caused a global conflagration in the last century. If this continues, the “resistance” will fail to protect the world from from a grave threat to our nation and the world. The new cold war can only be stopped by a mass movement of people who are willing to stand against the reckless rush into chaos.